and who was notified of his death. In this case, Anderson's father received the news. Carl Oscar Anderson was born on March 3, 1893 in Orlando, Florida to parents Axel and Augusta. He was the third of five children. Around 1913, the family moved to Miami, Florida, where Anderson found work at Melrose Dairy. On June 5, 1917, he registered for the draft, and on October 6, 1917, he was inducted into the United States Army. Throughout his service, Anderson maintained the rank of private as he served in multiple units in his first eight months. Then, on June 20, 1918, he departed for France and became part of Company B of the 30th Infantry Regiment, 3rd Division. He and his unit likely participated in the Battle of Meuse-Argonne. On October 3, 1918, Anderson was killed in action, likely during the advance to Bois de Beuge. His legacy lives on, memorialized on the Lake Eola Tablet in downtown Orlando. 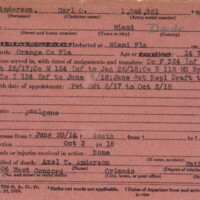 Digital reproduction of original double-sided typewritten abstract of military service, May 17, 1920: World War I Army Card Roster, 1924: Florida, Box 1. Originally created by P.C. 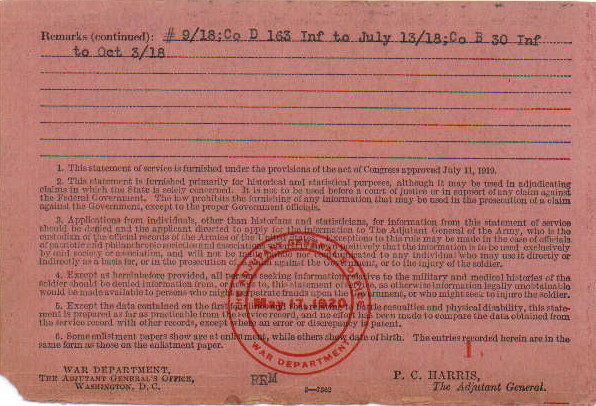 Harris and published by the General Adjutant's Office. American Battle Monuments Commission. 3d Division, Summary of Operations in the World War. Washington, D.C.: Government Printing Office, 1944. Florida Department of Military Affairs. "Carl O Anderson." Online database with images, FloridaMemory. Miami, Florida. Army Box 1. Accessed October 15, 2018. https://www.floridamemory.com/items/show/192012?id=1. Selective Service System. "Carl Oscar Anderson." 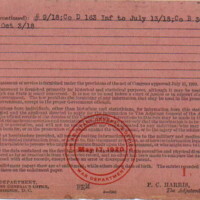 United States World War I Draft Registration Cards, 1917-1918. Online database with images, FamilySearch. Dade County, Florida. NARA microfilm publication M1509, FHL microfilm 1,556,881. Accessed October 16, 2018. https://www.familysearch.org/ark:/61903/1:1:K35D-HZW. The Ocala Evening Star. "Killed in Action." December 5, 1918, 1. Accessed October 16, 2018. http://ufdc.ufl.edu/UF0075908/07108/1j. The Orlando Sentinel. "Eola Tablet Honors World War Dead." August 22, 1937, 4. Accessed October 16, 2018. https://www.newspapers.com/newspage/295283216. Adjutant General's Office. 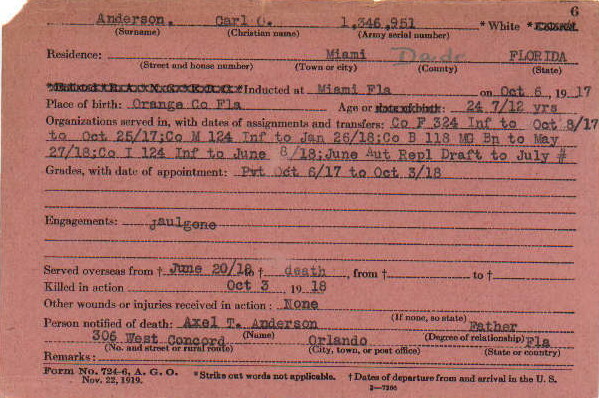 “Abstract of Military Service for Carl Oscar Anderson.” RICHES of Central Florida accessed April 22, 2019, https://richesmi.cah.ucf.edu/omeka/items/show/10433.